Buy Suma Rosemary & Lavender - 95g in the UK from our online shop or directly from our independent Scottish store. A natural coloured bar with rosemary leaves. Lavender essential oil soothes the mind and spirit while rosemary leaves and essential oil combine to waken and refresh, leaving your skin feeling toned, gently exfoliated and thoroughly revived. Sodium olivate, sodium cocoate, aqua, butyrospermum parkii (shea) butter, rosmarinus officinalis (rosemary) essential oil contains limonene, lavandula angustifolia (lavender) essential oil contains linalool, rosmarinus officinalis (rosemary leaf). Where can you buy real Rosemary & Lavender Soap Bar safely online? If you are wondering where you can buy Suma Rosemary & Lavender - 95g safely online in the UK, then shop with us. 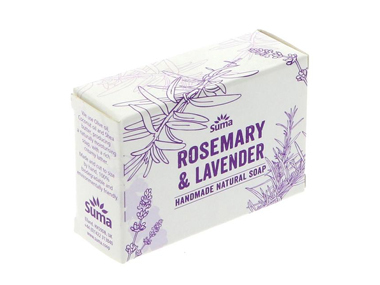 Rosemary & Lavender Soap Bar - Suma Rosemary & Lavender - 95g in Hand Soap Bars and Hand Soaps.